Ahem. How can one allege that “it’s all about the Benjamins” and that Jews are less than loyal to the US and have it not be intended in an “anti-Semitic way”? If she “didn’t appreciate the full weight” of the first remark, for which Pelosi forced her to apologize, shouldn’t Omar have realized it with the latest remark — for which Omar now refuses to apologize, even after having it explained to her? That assumes a lack of agency for Omar that doesn’t necessarily comport with reality. For one thing, Omar isn’t some naïf lost in an unknown political wilderness. She’s 38 years old, not 19, and has been involved in electoral politics for six years, having managed a campaign for a Minneapolis city councilman in 2013. She won her election to the state legislature in 2016 and then served as Assistant Minority Leader for the DFL in that session. She was savvy enough last year to use “Islamophobia” as a cover when a Republican House member of harassing her when he accused her of misusing campaign funds. First, when questioning longstanding congressional support for Israel, she blamed the campaign money provided by pro-Israel supporters. “It’s all about the Benjamins, baby,” she tweeted. After apologizing for those comments and acknowledging her need to be “educated,” she followed with another tweet questioning the “allegiance” of supporters of Israel, intimating that we place the concerns of Israel above those of the country that we call home. While Emanuel goes out of his way to allow for Omar’s potential for growth on this issue, he’s not falling under Kamala Harris’ spell about potential for harm. Emanuel treads carefully by focusing his ire on her statements as anti-Semitic rather than calling Omar herself anti-Semitic. Emanuel also calls out Islamophobia in his piece, but frames it as something that deserves direct criticism when it occurs rather than getting buried in an ambiguous “All Hate Matters” approach. “It’s time for Omar to learn that lesson,” Emanuel concludes. Not according to Pelosi, who’s now doing her best to run interference for Omar with this All Hate Matters strategy rather than focusing on Omar’s specific peccadilloes. 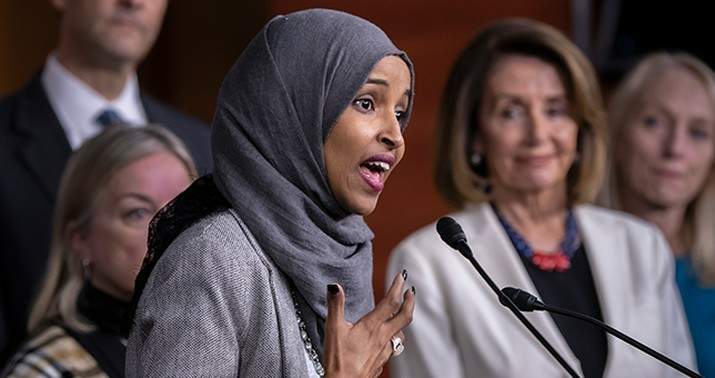 “It’s not about her,” Pelosi added today, “it’s about these forms of hatred.” If Omar’s airing those forms of hatred, however, why isn’t it about her? Leaving CBC meeting, members formed a circle around @IlhanMN and Marcia Fudge literally stuck her arm out to prevent reporters from asking her questions. Then a few members hugged Omar, including Al Lawson. Is it really time for Omar to “learn that lesson”? Emanuel’s fellow Democrats appear to disagree. Perhaps he might want to ask Nancy Pelosi for an explanation. Addendum: The vote on Pelosi’s All Hate Matters resolution, for what it’s worth, will likely take place today. Update: Reworded the first sentence referring to agency for better precision. Clyburn didn’t give Omar agency, he gave her some credit for her own agency.